This one appeared in the Monday 13 January issue of The Canberra Times. The Gemini Cryptic is a British cryptic, set by two people. More detail here. As ever, the definition is underlined (except in double and cryptic definition clues). Cryptic definition. Nothing to do with hiring people, this guy needs a pole to spring up with! Charade clue. Of French = DE ('of' in French) + FENCE (a miscreant, as in someone who received stolen goods). Cryptic definition. Reference to 'gild the lily' and a girl's name. Anagram (turn into) of in use can. Anagram (wreck) of a ship + O (nothing). Her is the definition, indicating (a little unfairly) any girl's name. Cryptic definition. Nothing to do with prophylactics or population control, but checking as in recording! Container clue. You need some knowledge of rowing as a sport to get this one! Agreement inside (among) rowing men = YES in EIGHT. Double definition. Call someone on the phone, or ring them. And a boxing ring. The third of October = T. The third letter of October, get it? With RITE (ceremony) tacked on. Anagram of Algeria. This clue is unfair, as there is no anagram indicator. A fairer version would be something like Royal symbols from Algeria in disarray. Cryptic definition. Refuse is a noun here, meaning stuff that's thrown away, rather than the verb. Hidden word, in another nest. A bird that mainly resides in crosswords nowadays, ERNE is a literary term for the sea eagle. Charade clue. VENUE (place to meet) after A. An apt clue to appear during the Australian Open ... cryptic definition, referring to the tennis court, not a legal court! Anagram (arranged) of see Scotland. Cryptic definition. Not a financial backer, but someone who is driving backwards! Double definition. People who share are those who divide things up. And dividers are a measuring compass, often seen in geometry sets at school. Container clue. Put RE (about) + M (thousand) in PIER (support). Slightly cryptic definition. Greek mythology. Refers to Charon, the old man who ferried souls into Hades, across the Rivers Styx and Acheron. Anagram (sorted out) of mails. 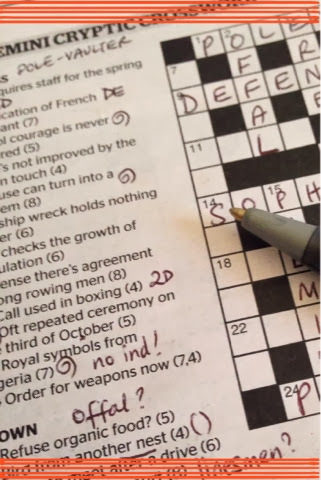 This clue gets the 'longest definition' prize for this crossword! Hidden word clue, the answer is in Panama graveyard. Agra is where the Taj Mahal is located. Liked all these, except perhaps 2D "OFFAL" - not sure how the "organic food" part of the clue fits in. I agree, I didn't feel the OFFAL clue was very clear, maybe I'm analysing it the wrong way? Surely 'food' alone implies 'organic' in nature (although maybe not with *all* food around nowadays!) — in terms of the definition of 'organic' = containing carbon. Hi Denise, can you help with a few clues I have? Sure thing, happy to try!